The Surrealist French director Jean Cocteau once said that “film is a petrified fountain of thought”. Judging by his cinematic interpretation of the classical Greek myth ‘Orpheus and Eurydice’, his thoughts at the time were pouring over the meaning of love and death. He had already contemplated these subjects in his first film Blood of the Poet (1930) and, now at the age of sixty, he was once again turning his mind to them. 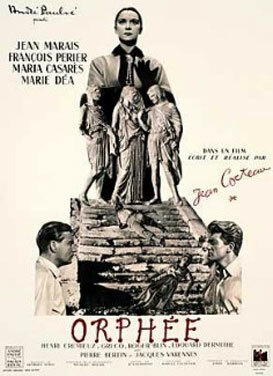 Cocteau cast his chiselled lover Jean Marais in the title role as an egocentric poet who falls in love with death. Also known as The Princess, Death is a seductive creature played by the wasp-waisted Maria Casares who also starred in Cocteau’s masterpiece Les Enfants du Paradis. Orpheus meets her at a Left Bank café when she arrives with the much younger poet Cegest (Edourad Dermithe) whom the beatniks now favour over the fading Orpheus. But Cegest is drunk and instigates a brawl which spills out onto the street where he is knocked over by two speeding motorcyclists. The Princess bundles his body into her waiting Rolls Royce and ushers Orpheus in too then the chauffeur Heurtebise (Francois Perier) whisks them away in his inimitable style. Soon after, the Angels of Death also claim the life of Eurydice (Marie Dea), Orpheus’s lovely pregnant wife, and Orpheus must journey through the mirror into the underworld to rescue her. “A legend is entitled to be beyond time and place”, Cocteau declares in his opening narration and this version, while very much of its era, has some timeless touches including special effects that would’ve seemed amazing to audiences at the time. Cocteau would revisit the story again a decade later in his final film The Testament of Orpheus but this, the second in his Orpheus Trilogy, is the standout.